Want your customers to think of you while they eat? While they look for snacks? While they pass the kitchen counter? Large refrigerator magnets can make that possible. They are effective marketing materials that create top of mind brand awareness. These magnets are most ideal for businesses in the food industry. You can put contact details, so customers can call you anytime for deliveries or reservations. 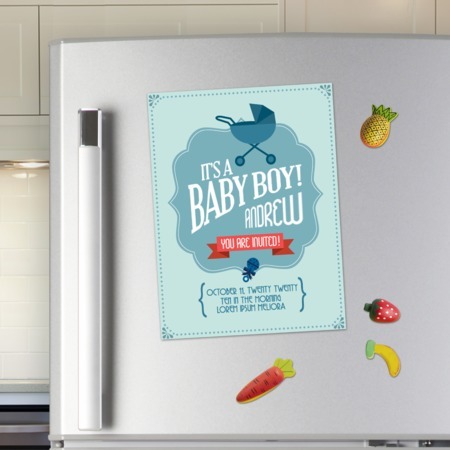 Large refrigerator magnets are good for highlighting best-sellers and promotions. Because of its size, you can put more images and information. Our refrigerator magnets are available in different standard and customized sizes. We print your designs on a 17 pt. thick high gloss coated magnet. Upload your file or create your own designs online. To get started you can download our free magnet templates. With a minimum order of 25 pieces, you can order up to 5,000 magnets per transaction. Standard turnaround time for printing is 6 business days. For more information on our magnets you can call us at 1-888-888-4211.